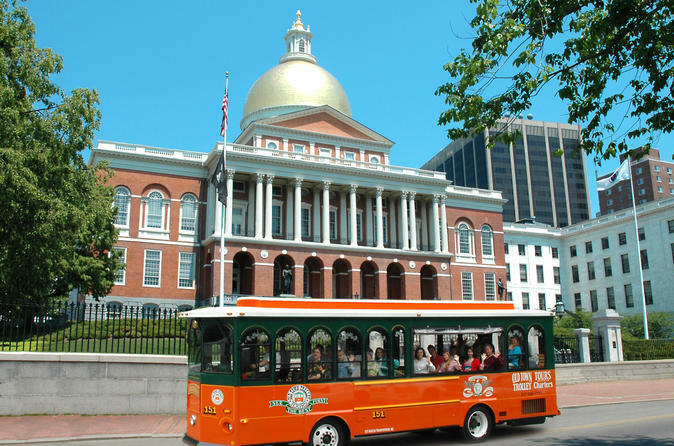 Hop off your cruise ship and hop on this Boston sightseeing trolley tour to explore Boston at your own pace. You can hop on and off at any of the 18 stops as often as you like. Trolleys depart every 20 or 30 minutes (depending on the season). Pass by Boston’s most popular sights, including the Cheers bar, Beacon Hill, Cambridge, the USS Constitution and the North End, just to name a few. Great shopping can also be found throughout the city, including at the famous Faneuil Hall Marketplace. Expert tour conductors will bring Boston's history to life, weaving together colorful anecdotes, humorous stories and well-researched historical information. Enjoy admission to the Old State House (across from Stop #5), Dreamland Wax Museum (between Stop #5 and Boston City Hall) as well as half priced admission to Old North Church (a short walk from Stop #2) with the purchase of your tour. Show your trolley ticket (after voucher exchange) to receive free admission to the Old State House, Boston's preeminent historical museum. The museum's collection includes authentic artifacts chronicling Boston's history, all housed within the oldest surviving public building in Boston. The Old State House Museum is conveniently located at Trolley Stop #5. The trolley boarding location is within a 5-minute walk to the cruise port, so you determine the time you return to your ship in Boston. Please allow yourself ample time to enjoy Boston and ensure your timely return to the port as this excursion is independent of your cruise-line. This excursion is not covered by our worry-free policy and is available only to cruise ship passengers.